The actor Danjuro VIII as the ghost of Seigen from a set of prints Mitate sanjurokkasen no uchi, “An Imaginary Thirty-six Poets” published by Iseya Kanekichi in 1852. The relevant poet in this case is Ariwara no Narihira. The corrupt priest Seigen broke his vows of chastity when he fell in love with Sakurahime. 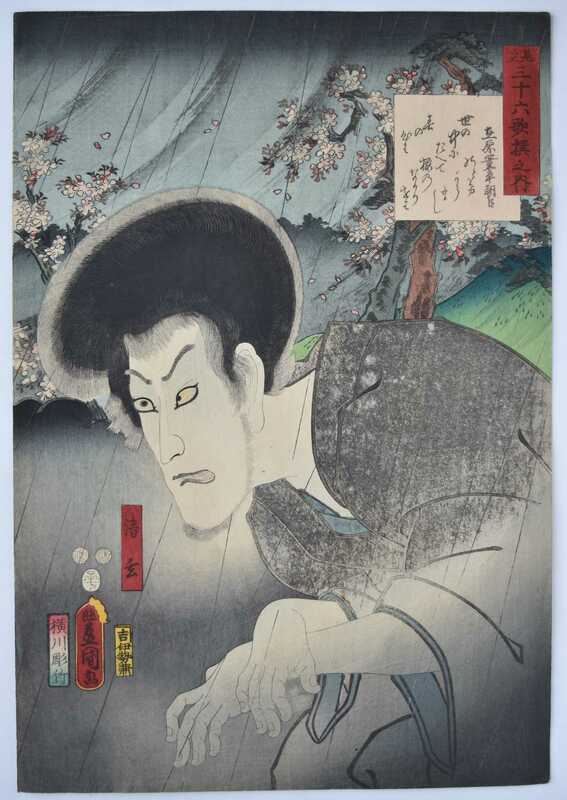 Danjuro played this role in the play Yami no ume yume no tamakura, in the New Year’s programme at the Kawarazaki theatre, Edo, in 1/1853. Very fine early impression with glue applied to the eyes. Fine colour and condition. Signed Toyokuni ga.